. . . When you write a dog’s internal monolog, as I do with Hank, it gives the narrative a fractured, lurching flow that tends to move in circles. And that can be very funny. A conversation between Hank and Drover is actually two conversations, neither one related to the other. Hank often pauses and says, “Drover, is there some point to this conversation?” The answer, of course, is no. 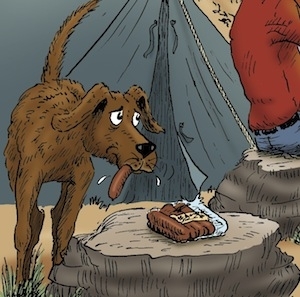 It is a pointless romp through the minds of two dogs who are pretty dumb, but don’t know it. When I go out on the front porch and look into the eyes of our dogs, I know that if they could talk, that is exactly the kind of conversations they would conduct. For all their faults, dogs make admirable characters. They don’t hold grudges. They forgive easily. They don’t solicit money, sell products, or extract taxes. They don’t argue about politics or religion. And though they are fools most of the time, occasions arise when their courage and goodness are tested, and some of them—maybe most of them—respond in a manner that can only be called heroic. When Hank tells us that he’s prepared to go down fighting for his ranch, we might think we’re listening to a buffoon, but he’s not kidding. The question, really, is why would anyone want to write about anything but dogs? There is one danger, though. Once you’ve seen the world through the eyes of a dog, you can never go back to writing Serious Literature. Be sure to let us know know what you think about this post in the comments section below!